Dip, or immersion refractometer is designed to allow quick measurement of the refractive index of the liquid directly in the vat, without a need of taking samples. Simplest design is a refractometer that you just immerse partially into solution to make a measurement. 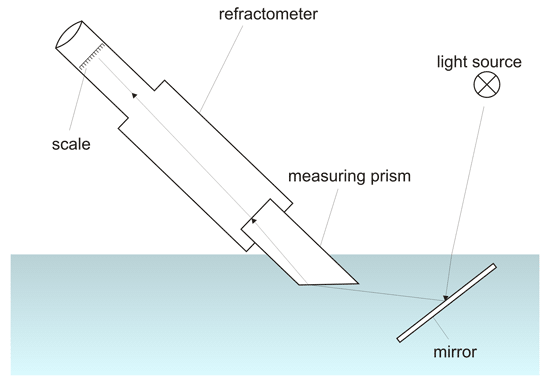 In most cases dip refractometer is just a liquid proof Abbé refractometer (critical angle refractometer) mounted in a tube, with an additional immersible light source, or mirror that helps direct natural light on the measuring prism surface. If the light is directed at almost grazing angle, illuminating prism in not necessary. Immersion refractometers always work at the temperature of the liquid, so they either need built in temperature compensation, or the measurement result has to be corrected for the temperature using tables. First immersion refractometer was designed by Pulfrich and introduced by Carl-Zeiss in 1899, soon to be followed by an improved model in 1902. The refractometer didn't have an illuminating prism and a movable telescope - refractive index was read directly from the linear 1-100 scale. The measuring prism was sticking out from the tube and was the only element of the refractometer that was in the contact with the solution, which helped keep the device corrosion free even in highly acidic solutions. Lack of the movable telescope meant the device had a very narrow working range, and required calibration, but it could also yield very high accuracy. Later instruments had interchangeable measuring prisms, which allowed measurements in a wider range of refractive indexes. This site is in construction. More to come. Page was last modified on April 10 2012, 11:21:18.
this site is sponsored by: pH calculator, concentration calculator, stoichiometry calculator and buffer calculator.